Suzuki’s commitment to all kinds of motorcyclists is nowhere more obvious than in its lineup of cruisers. Suzuki builds a wide selection of models that appeal to people of all ages and experience levels. Classically-styled motorcycles with upright handlebars, plush seats and comfortable riding positions. But don’t let the familiar lines fool you. Each one of these bikes comes standard with up-to-date technology, as seen on the all-new Intruder Volusia 800. With seven bikes ranging from 250cc all the way to 1500cc, there’s plenty to choose from. 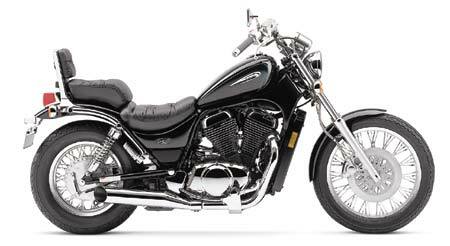 For 2001, the 800 Intruder has been updated with new colors and graphics. The 800 Intruder is uniquely styled with a classic “chopper” look that sets it apart from other mid-size cruisers. Polished spoke wheels, an abundance of chrome and beautiful two-tone paint give this bike the look of a one-off custom. Built to rumble through town or across the open road, the Intruder gives cruiser enthusiasts the low-slung look and throaty sound they crave. Plus there’s the benefits of modern engineering with an advanced liquid-cooled, V-twin engine with four valves per cylinder and low-maintenance shaft drive. *Suggested Retail Prices (MSRP) shown do not include freight/ destination or other dealer charges. Engine type: Water-cooled 805 cc SOHC 45° V-twin, 8 valves. 50 hp (36,8 kW)/ 6,500 rpm, 62.1 Nm/ 4,000 rpm.